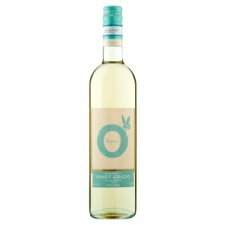 Refreshing with typical flavours of citrus and pears and notes of creamy almonds on the finish, an indication of the care and attention to the vines of quality Organic Pinot Grigio. Pinot Grigio grapes has to be grown in Veneto and Friuli Venezia Giulia regions, plus an area of Trentino (province of Trento). Starting from 2017 vintage, every Pinot Grigio delle Venezie DOC bottle bears a Government Quality Label displaying a number that makes it unique and traceable, together with the name and logo of the denomination. To enjoy this wine at its best, drink within < > of purchase. Fermentation takes place in 300 - 1600hl tanks at 18 °C for 8-10 days. The wine is then stored in stainless steel tanks for 3-4 months before bottling. The grapes to make this wine grow in clay and gravel plains (altitude of 25 - 50m) in the north east of Italy. The grapes are machine harvested at beginning of September and then traditionally destemmed and pressed.